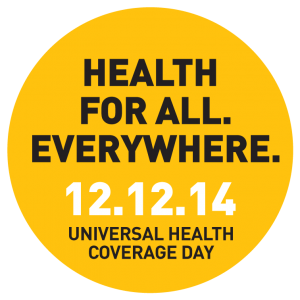 WeDpro joins over 350 organizations around the world to launch the first-ever Universal Health Coverage Day on 12 December 2014. This historic coalition marks the anniversary of a landmark UN resolution urging all countries to provide universal access to health care without financial hardship. No one should fall into poverty because they get sick and need health care. 1 billion people lack basic health care, and 100 million fall into poverty every year trying to access needed services. About 1/3 of households in Africa and Southeast Asia borrow money or sell assets to pay for health care. Universal health care is essential to creating a healthier, fairer, and more resilient society. This is an important issue to talk about – not just on Dec. 12, but throughout the year. For more information about Universal Health Coverage Day, please visit: www.UniversalHealthCoverageDay.org.